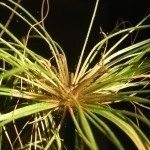 Can I put a spider plant outside in the summer months? I live in northern NJ. We would recommend that you keep them out of direct light and keep them well watered. They will need to come back in once the temps go below 55F.